Aluminium golf pitch repairer with a magnetic ball marker and a handy clip. The marker laser engraves to a White colour. A production lead time of 10-15 working days applies to this product. Colours: Red, Green, Blue, Black. Dimension: W 25mm x H 101mm. Print Description: Marker - Dia 12.5mm. Print Type: Laser Engraving. Packing: Loose packed. Less than minimum quantities are not available for this item. MOQ applies per colour on this item. Golf Towel. 560gsm - 100% Cotton yarn dyed towel with dobby border. One side terry towel. And the other side with velour finish. Colours: Black, Khaki, Navy, Red, White. Sizes: 38cm x. 65cm. Golf Towel with Ring & Hook. 560gsm - 100% Cotton yarn dyed towel with dobby border. One side terry towel and the other side with velour finish. Colours: Black, Khaki, Navy, Red, White. Sizes: . Affordable plastic golf ball marker. Colours: White. Dimension: Dia 18mm x 10mm. Print Description: 15mm circle. Print Type: Pad Print. Packing: Loose packed. Golf Towel With Hook. 380gsm - 100% Cotton yarn dyed towel with dobby border. One side terry towel. And the other side with velour finish. Decoration area (Max. 7cm in height.) Colours: Black, Navy, Red, White. Sizes: 40cm x. 65cm. Nonwoven (80g/m2), zippered bag for shoes with a clear window at one side, and a polyester carry handle, (approx. 2.5 x 20 cm). product_features : 12 x 36,5 x 16 cm. product_materials : PVC, Non woven 80gr. product_item_size : 12 x 36,5 x 16 cm. product_packaging_inner : 50. colours_available_appa : | black . brand_name : The European Collection. This quality golf pack is designed to attach to your golf bag and includes 2 golf balls, 4 tees and handy stainless steel golf tool with ball marker. (Golf tool also sold separately, see Golf Genie H5200). Individual Box. Black. This do-it-all stainless steel golf tool features a club head cleaning brush, knife, divot repairer, spike tightener and ball marker. Individual Box. Silver. This handy golf tee holder is supplied with 12 tees, 3 ball markers and conveniently attaches to any golf bag. Bulk Packed. White. Description: Protect your clothes whilst travelling or store your shoes when heading off to the game with the Platform Shoe Carrier.. U-shaped single zippered main compartment with mesh sides | Webbing carry handles | 600D/300D polyester with PVC backing | Business card holder on back. Size: 23cm w x 38cm h x 10cm d. Colours: Black | Navy. Decoration Areas: Embroidery | Supacolour | Supaetch Bags | Supasub Bags | Screen Print. 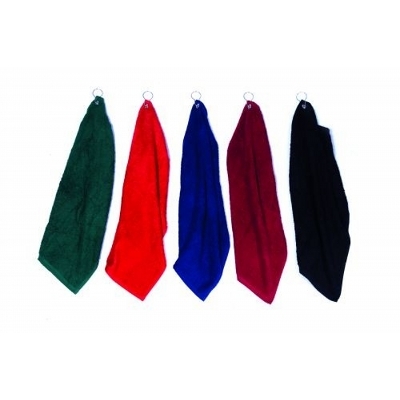 Luxury velour golf towel with tripled fold and neat caribiner. Materials: 100% cotton terry. Item Size: 50 x 75cm. Packaging: 4 per poly bag. Colours: Navy | Black. Decoration Options Available: Embroidery. Product Specs: * Neoprene & Reflective Material. * Plastic clip to hook onto shoelace * Velcro Closure * 53mm(W) x 82mm(H) x 35mm(D). Decoration Option: Screen Print. (Incl. 1 Colour). Fibre reactive printed hand towel with edge to edge printing up to 10 colours. Made in China. 40 x 60cm 12 week lead time Approx. Materials: 100% cotton velour. Item Size: 40 x 60cm. Packaging: single poly bag. Colours: 2 Custom colours. Elite - Large Plain terry Golf Towel with hook and grommet. 45x76cm, 500 gm2. Print or Embroidery recommended. PLEASE ADVSE HOOK AND GROMMET POSITION WHEN ORDERING. Materials: 100% cotton terry. Item Size: 45 x 76cm. Packaging: 10 per poly bag. Colours: Black | Navy | Red | Chocolate | Royal | Hunter Green | Burgundy | Orange | Steel Grey | White. Decoration Options Available: Print | Embroidery | Photo Decoration. Luxury velour Golf towel with border for full colour sublimated print. 450 gm2, includes hook and grommet in top left corner. Unprinted. Materials: 100% Cotton. Item Size: 40 x 65cm. Packaging: Single poly bag. Colours: Black | Navy. Decoration Options Available: Sublimated print. Decoration Areas: 40 cm x 8cm. Description: 12 golf ball tees and 3 golf ball markers on beaded chain.